Last month Karen from Didyoumakethat challenged us to raise money for the National Literacy Trust. As someone who hoards books probably even more than I hoard material and also having a child with reading difficulties, I couldn’t resist. Do you have those lengths of fabric that you daren’t cut into, you love it so much that you’re scared of ruining it? Well that was me with the Swiss cotton, I’ve had it for ages, I can’t even remember where I bought it! It’s a beautiful fine (very fine!! )_ cotton lawn with a check pattern. The weft line is actually a heavy gimp thread that’s been woven in, you can see it looping down at the end of the rows. whereas the warp line is finer. (If anyone needs help like me to remember the weft and warp, the weft goes from weft to right across the warp!!!) I just had a feeling it wasn’t going to be easy to sew…and I was right! I made up this pattern earlier in the year, so I knew it fitted ok. Problems started with the initial laying out of the pattern. 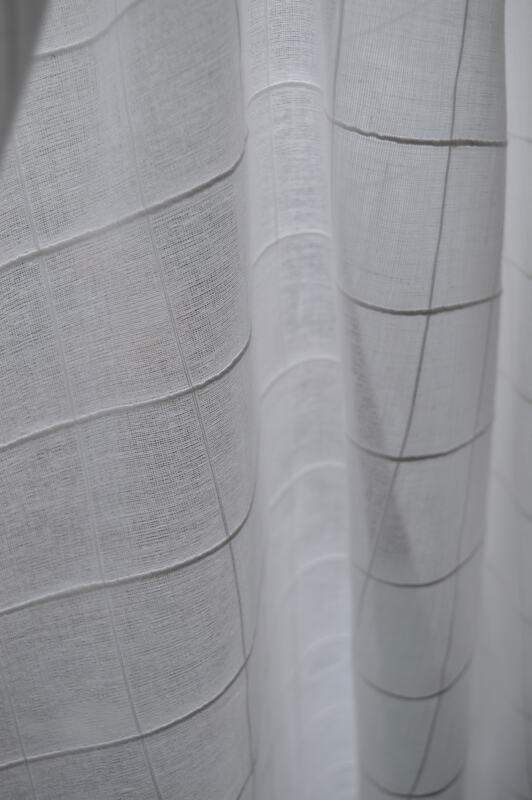 The cotton lines weren’t straight anymore, they sagged to the edges, the cotton is so loosely woven that there is a lot of movement within it anyway. I lined up the main pieces down the centre fold so as to get the least distortion. I wanted the pockets and the front button bands to be on the bias, luckily I only cut the pockets out to start with (more on the pockets later!) I reduced the size of the pleat very slightly on the centre back so I could match up the lines, which has worked fairly well. 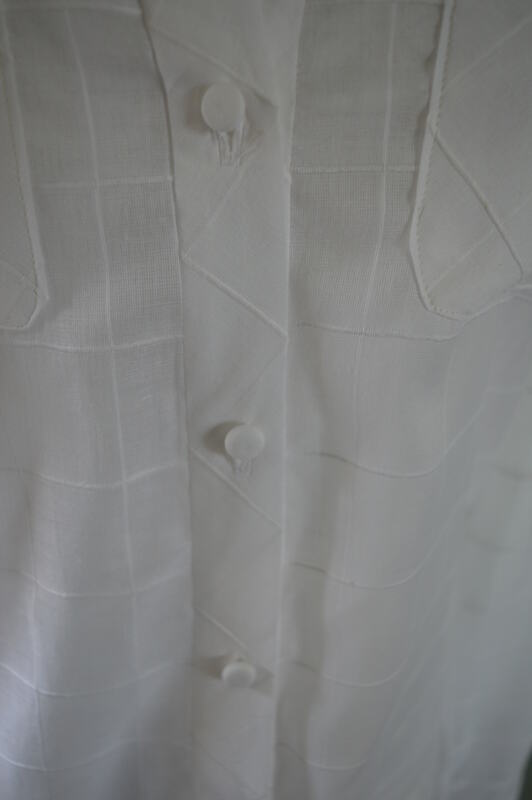 I used a fine plain cotton lawn as a lining / facing on pieces such as collar, cuffs and yoke as the pattern would have shown through and looked confusing. It also helped to give a bit of stability. The first stage of the instructions was the pockets,well that was a disaster!!! I’d cut them on the bias and when I tried to press under the edges, it totally distorted, the upper edge stretched, it was unusable! I decided to carry on and see if I need pockets! 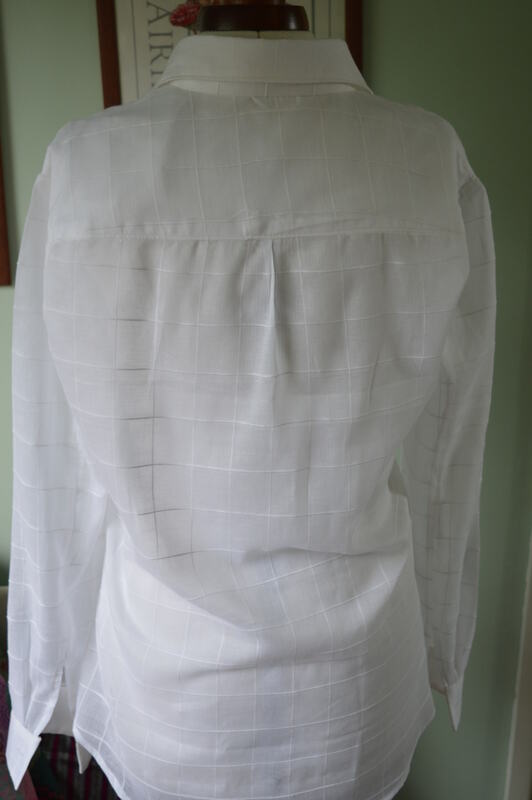 The main shirt went together nicely, I took my time and didn’t rush the fabric, I French-seamed where I could and zig-zagged to finish where I couldn’t. The yoke went on ok, although if I made it again I would ignore the curve on the pattern and cut it straight. I think it looks a bit messy with the curve. My next issue looming up was the bias cut buttonband, after the disaster of the pockets I was not looking forward to it. Then I had a brainwave…I cut out a length of fusible interfacing bigger than the band. 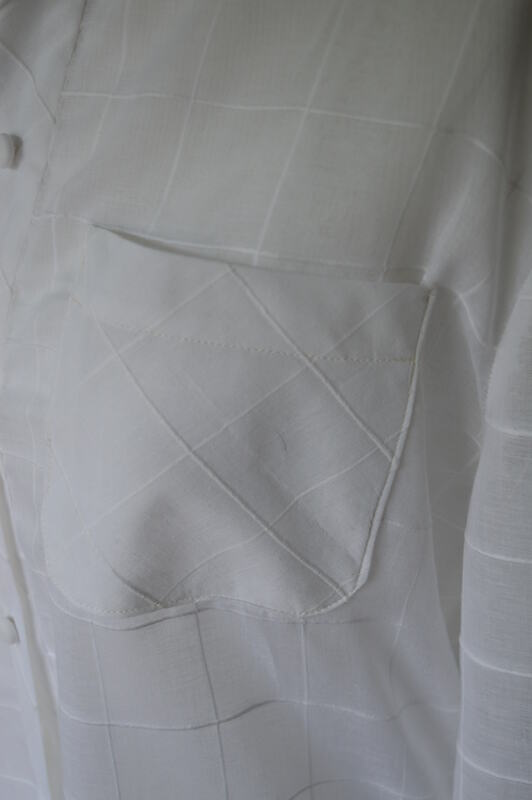 I fused it to the material and then cut it out, it worked a treat, so I did the pockets the same way! I’m really chuffed with the buttonband, the zig-zag goes neatly down it! 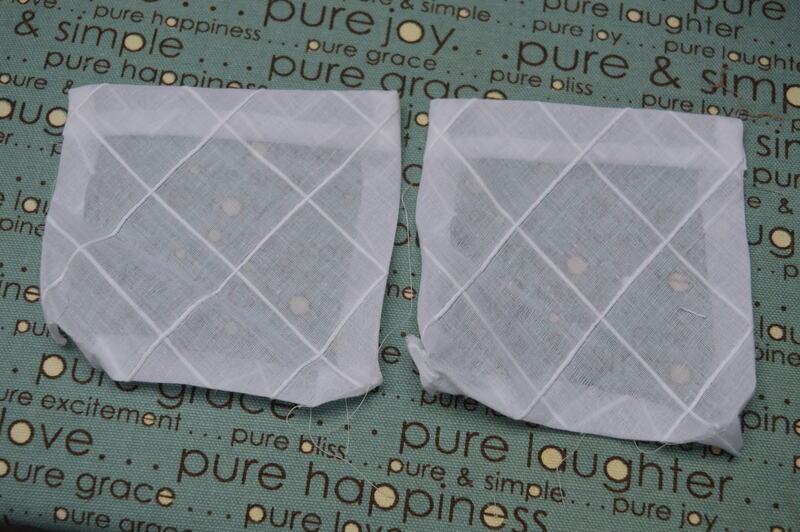 The pockets stitched up fine once they had the support of the interfacing. I learnt something new the other day on facebook, I’d been having a few issues with interfaced fabric going bubbly, apparently it’s due to using steam…hands up on that one, there is a part of me doesn’t understand the difference between using a damp teatowel and a dry hot iron, and using steam. But there must be a difference because apparently that is the cause. So today I have returned to the damp tea towel in the hope that it will stay smooth! The collar went on surprising easily. The checks came out even too! I took the advice of McCalls and interfaced both pieces for the collar band, it gives a bit more support, especially with my material being so fine. I quite fancied using some vintage pearl buttons as I have a box of them, but they just looked too yellow, so I covered some 11mm buttons with the plain white. I stitched the buttonholes so they followed the pattern. 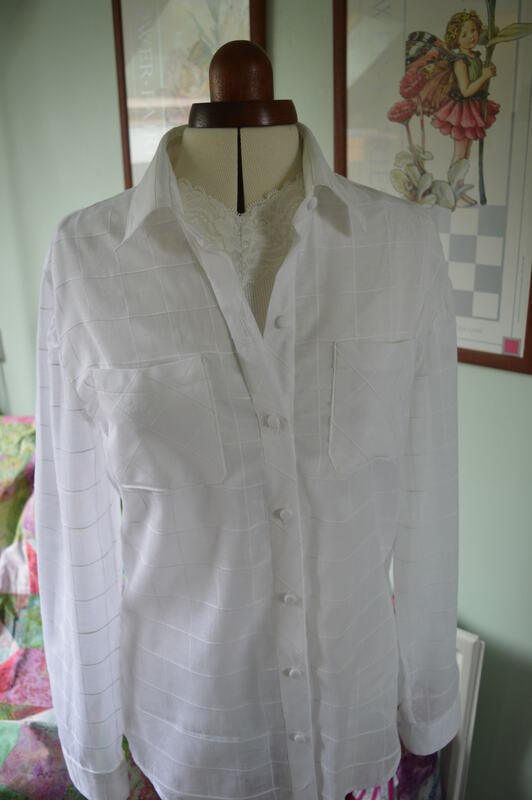 This entry was posted in Dressmaking, Serendipity, Sewing and tagged Dressmaking, McCalls 6613, Shirt making. Bookmark the permalink. 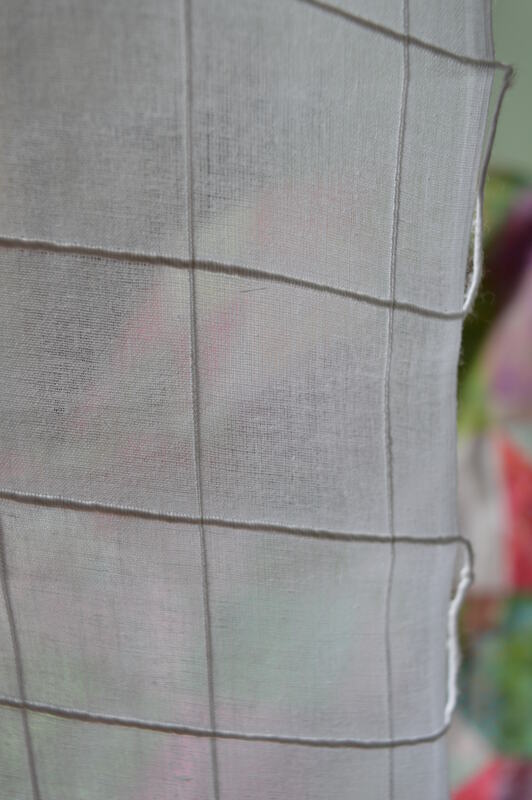 Congratulations on making a lovely shirt out of some really tricky, but beautiful, fabric! And well done for completing your pledge on time! I’ve just finished the last bit of sewing for my pledge but I won’t get the chance to blog it until tomorrow. Thanks Corrine, I needed the challenge to make me do it, I’ve been looking at this in my stash for months if not years! Thanks Ali, I’m really pleased with it, I know what you mean about buying fancy prints, my stash is full of the! Somehow the plains rarely jump out of the shop as much, but I need them to wear with the patterns! Lovely fabric and a really lovely shirt. Very envious, I’ve had but nothing but disasters with tops and shirts. I hope you enjoy wearing it, you should be really proud of your project especially as it was for a great cause. Thank you, now I’ve mastered this shirt I think I’ll make a couple more for winter, with some more fabric from my stash!